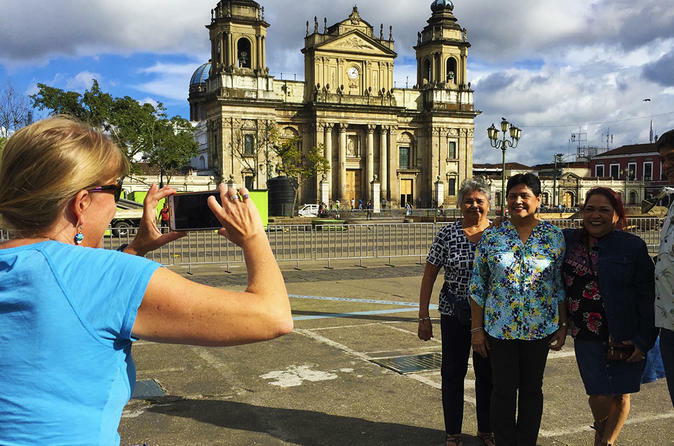 Explore Guatemala’s top two cities — Guatemala City and Antigua — in one full day of sightseeing that combines a vehicle tour and a walking tour. In the capital city, see major attractions like the Civic Center, Constitution Plaza, Metropolitan Cathedral and the Central Market. Then take a walking tour of the World Heritage-listed old city of Antigua to see its top landmarks, including Santa Catalina Arch, Central Park and La Merced Church. Lunch is included. After hotel pickup, your sightseeing tour of Guatemala City, or La Nueva Guatemala de la Asunción, as it’s formally known, starts on Avenue of the Americas (Avenida de las Américas), named in honor of the 1948 formation of the Organization of American States. Next, head to the Civic Center (Centro Cívico), where you’ll see many buildings from the 1950s and ‘60s. Pass by City Hall, National Mortgage Bank, the Supreme Court, the Ministry of Public Finance and the Guatemalan Tourism Commission. When you reach the Bank of Guatemala, admire the high-relief murals by artist Dagoberto Vásquez that depict scenes from Guatemala history, and see a mosaic by artist Carlos Mérida. Continue your tour to Constitution Plaza (Plaza de la Constitución), the heart of Guatemala City’s historical center. See surrounding landmarks like the National Palace of Culture (Palacio Nacional de la Cultura), the National Library and Metropolitan Cathedral (Catedral Metropolitana), which was originally built in the late 1700s. Finish the Guatemala City portion of your full-day tour at the Central Market (Mercado Central) behind Metropolitan Cathedral, where you can browse the art and handicraft stalls. Shop for ceramics, leather, wood objects and jewelry from artisans across the country — they make great souvenirs or gifts! Enjoy lunch with your guide at a local restaurant that serves typical Guatemalan dishes, and then head to Antigua Guatemala, meaning Old Guatemala, about 45 minutes west of Guatemala City. A UNESCO World Heritage site, Antigua is known for its old-world charm and Spanish colonial buildings. Follow your guide on a 3.5-hour easygoing walking tour of the old city, checking out its top attractions and strolling along its cobblestone streets. Visit Central Park (Parque Central), surrounded by notable buildings like the Palace of the Captain Generals (Palacio de los Capitanes Generales), City Hall, San José Cathedral and the Archbishop’s Palace. You’ll also see the famous Sirens’ Fountain, built in the 1930s to replicate the original from the 1700s. Enter the whitewashed San José Cathedral, consecrated in 1541, and admire its Baroque architecture, and then head to Santa Catalina Arch, built in 1694. Learn about the history of the concealed passageway, which allowed cloistered nuns to cross from the Santa Catalina convent to the other side of the street. Finally, visit stunning La Merced Church, home to Antigua’s largest fountain. Your tour ends with the drive back to Guatemala City for hotel drop-off.